MNO Veteran Exhibits Pictures in Georgian Bay Office. On October 4 the MNO Veterans Council represented by Doug Woods (MNOVC Sgt-At-Arms) went to the Georgian Bay Métis council office in Midland with the intent to hang some of the many pictures and gifts such as the 2017 canoe expedition gifted to them when the Métis Youth made a planned stop this summer on their 2000km journey. The dot art of the seven grandfathers teachings gifted by Veterans Senator Guy Mandeville C.D., the veterans paddle gifted to the MNOVC at a previous AGA in Sault St. Marie. As well as various certificates of appreciation. Pictured here is Doug hanging one of the pictures. Thanks to the GBMC for allowing the show case of these and many more pieces of art from our citizens. On September 21st, 2017 the CFB Trenton Defence Indigenous Advisory Group hosted a Métis Dot Painting Workshop at the Three Sisters Garden Caribou Lodge. Guy Mandeville, CD MNOVC Senator directed the workshop. Twenty people from the base (both military and non-military) attended. The session was conducted as a lunch and learn activity, many of the first time artists in this medium did outstanding work. Guy Mandeville will conducting a future session at the Military Family Resource Centre at CFB Trenton in October has to be confirmed. Also see photos tab. At every AGA, the Suzanne Rochon-Burnett Volunteer of the Year Award is presented to one outstanding volunteer. This year it went to Greg Garratt who is well-known across the MNO for his work as Secretary-Treasurer for the MNO Veterans Council and Captain of the Hunt for Region 7. Greg was stunned by the award and while humbly accepting it took the time to recognize the work done by all of the MNO’s many volunteers. Well done Greg.....from all of of us at the MNOVC. 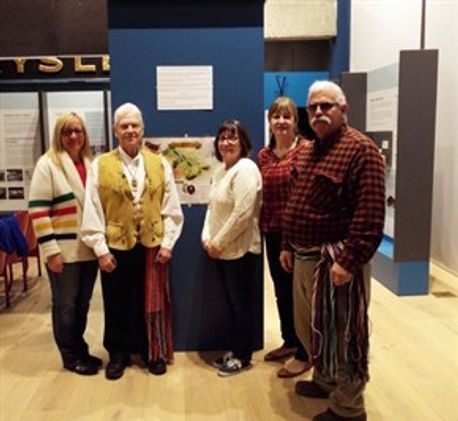 The Métis Nation of Ontario (MNO) Windsor-Essex Métis Council (WEMC) worked with the Chumzuk Museum in Windsor to develop a small Métis display as part of two displays being exhibited at the Museum. The display is called There’s Indian in the Family and Métis/Half Breed People, and the text and maps used were taken from the MNO Education and Training Métis Education Kit and included Métis contributions during the War of 1812; which was an important event in the Windsor area. The MNO WEMC was part of a planning committee that the Museum formed to encourage groups within the Windsor area to share their stories through artifacts and personal collections. MNO WEMC Senator Jim Turner provided a prayer that was also incorporated into the display. By March 1, 2017, the Métis display was ready and the MNO WEMC was very pleased with the final result. The main purpose for the display was to promote the MNO WEMC and encourage local MNO citizens to be proud of their Métis history. The second display is still under construction. It will be larger and will focus on the Métis historical timeline. It will also feature some updates about the most recent Métis rights cases and Margaret Froh, the first woman to become MNO President. The second display will also look at the contributions of Métis to Canada and Ontario within the context of Canada 150. This will include the achievements of Ontario Métis, the Red River and Northwest Resistances and Manitoba’s entry into Confederation. The MNO WEMC respects that there is varied views on Canada 150, so the second display will show Métis progress within Ontario and also respect the contributions of Métis veterans. 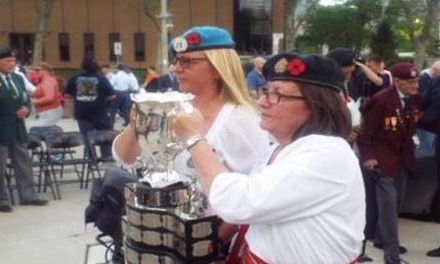 Métis Nation of Ontario (MNO) Veterans Shelly Claus and Sharlene Lance carried the Memorial Cup in a parade in Windsor on May 18, 2017. The special ceremony that was open to the public was held at the Essex County War Memorial in City Hall Square. The Memorial Cup was displayed at the Windsor City Hall for public viewing after it was handed over to the Mayor of Windsor Drew Dilkens by Claus and Lance. Claus is the Women’s Representative for the MNO Veteran’s Council and Lance is a Veteran and Women’s Representative for the MNO Windsor Essex-Kent Métis Council (WEKMC). The trophy arrived in Windsor along the Detroit River aboard the Canadian Coast Guard (CCG) Vessel Constable Carrière before docking at Dieppe Gardens. From there the Cup was carried by a military parade to the Cenotaph on University Avenue. The procession included Windsor Police Services, Royal Canadian Legion Colour Party Zone A-1, Sterling Heights Police Colour Party, Royal Canadian Navy, Windsor Regiment, Essex and Kent Regiment, #31 Service Battalion, RCMP, CBSA, Veterans, Cadet Units, Windsor Fire Department and Military G-Wagons, M-37’s and 43 Willys Jeeps. The Memorial Cup, one of the most prestigious and coveted trophies in North American sport, has a rich tradition that has shaped the way junior hockey is played in North America. The trophy originated in 1919, in remembrance of the many soldiers who paid the supreme sacrifice for Canada in The First World War. In 2010 the Memorial Cup was rededicated to the memory of all fallen Canadian military personnel. The Memorial Cup is a junior ice hockey club championship trophy awarded annually to the Canadian Hockey League champion. It is awarded following a four-team, round-robin tournament between a host team and the champions of the CHL's three member leagues: the Ontario Hockey League, Quebec Major Junior Hockey League and Western Hockey League. Sixty teams are eligible to compete for the Memorial Cup, representing nine provinces and four American states. Vimy Ridge monument at the War Museum. As part of the Vimy Memorial Project that took place from April 7-9, 2017, the Métis Nation of Ontario (MNO) Veterans’ Council brought Métis veterans from Ontario and British Columbia together with Métis youth for Vimy commemoration events that took place over that weekend in Ottawa. On the April 8, the Saturday of the weekend, Métis Nation of Ontario (MNO) President Margaret Froh and MNO Veterans’ Council, Métis Youth and Veterans from Métis Nation British Columbia (MNBC) boarded a bus to the Canadian War Museum in Ottawa. Upon arrival, the delegation split into two with a mix of Ontario and British Columbia veterans and youth in both groups. The War Museum guides were knowledgeable and led the group on a journey through the Museum. After the guided portion of the tour, everyone was free to investigate and look around more to see what the Museum had to offer. In the Great Hall, there were tanks, jeeps, personnel carriers, a jet fighter suspended from the ceiling and a variable depth sonar and naval gun. 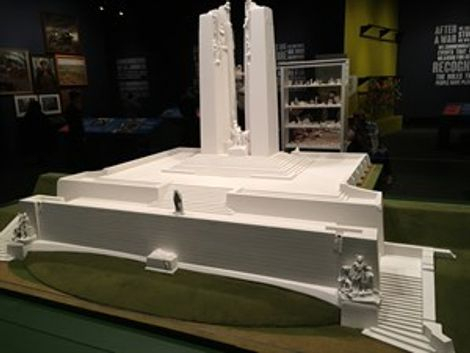 There were also replicas of the statue figurines from Vimy Ridge monument in France set out in a symbolic way with the sun shining through a long narrow but high glass window. The separate exclusive Vimy Ridge exhibit was breath taking and moving to say the least. The back wall is lit up with 3,598 lights to represent all who fell at Vimy. As the group walked through the exhibit, there were displays of life-sized soldiers and also videos with about the Vimy Ridge Monument. The life-sized soldiers gave the group an incredible feeling as if they were standing with them and there was a loud silence in this exhibit that was very solemn that allowed reflection on what these young men must have been thinking prior to jumping out of their trenches to do battle. MNO citizen and veteran Ron Gignac C.D., (right) being sworn in by Justice Stephen Hunter (left) as the Chief of Police for Belleville. Ron Gignac, a Métis Nation of Ontario (MNO) citizen and Veteran, was sworn in as Chief of Police during a news conference at Belleville’s City Hall on January 12. In a packed courtroom, Justice Stephen Hunter administered the oath of office and oath of secrecy before Mayor Taso Christopher who is also chairman of the Belleville Police Services Board and who presented Chief Gignac with his badge. Gignac has been with the Belleville Police Service since July, 2015. He was initially hired to fill the then-vacant role of Deputy Chief. In November 2015, it was announced that former police chief Cory MacKay would retire and that Gignac was set to take on the chief position. In his address to fellow members of the service, Chief Gignac said “you are the finest team in the province, bar none. “Policing and keeping our community safe is a 365-day a year effort. Thank-you for standing on the blue line and for standing on the wall here for Belleville, and for your willingness to lay down your life, if need be, for a stranger,” Chief Gignac said. He recognized the presence of members of the Canadian Forces in the room, including 8 Wing/CFB Trenton base Commander Col. Colin Keiver and Chief Warrant Officer Darcy Elder. Chief Gignac also noted the Belleville police would recognize the work and sacrifices of military members by adding a yellow ribbon to police vehicles during the upcoming re-branding process. Also see photos tab for additional photos. By: MNO Veteran Randy Chartrand C.D. Hello all, I just wanted to share my experience from my trip to Vimy Ridge in France. I met many extraordinary people and had one amazing thing happen after another. First started out by chance finding a last minute airbnb that just came up one week prior to my arrival. It turned out to be right in the middle of the battlefield of the 1st Canadian Division in a town called Thelus. The owner of the farm was the daughter of a man who served with the French army in WW1 and her house was occupied by the Germans till the Canadians evicted the Commandant after they took the ridge on 9 April 1917. She told me about some bunkers behind the house on the other side of the field so I went and checked them out. They were still intact gun placements and were amazing. This is where I found an unexploded artillery shell. 300 meters in front of the house is a memorial to the 1st Canadian Division and further down the road about 650 meters is Bois Carre Cemetery where we have 500 buried. Mostly Canadians from WW1. I visited a few cemeteries on my short visit like Beehive and Villers Station and planted some Canadian Flags at some of the grave sites. 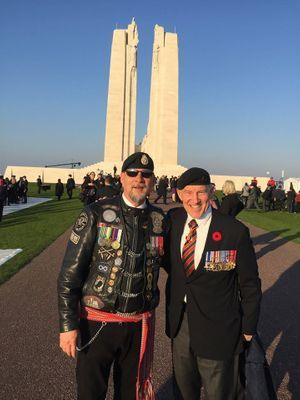 On April 8th I attended the Sunrise Ceremony at the Vimy monument with Aboriginal Canadians and around 100 in attendance including our Governor General. It was an incredibly moving ceremony that I had the honour of being the fire keeper. That evening I attended the Sunset Ceremony with our Canadian Military. The next morning on April 9th I had the privilege of re-tracing the route of the 16th battalion Seaforth Highlanders in the 2 Cdn Div at 05:30 when they went over the top. I was with a group of amateur historians including 2 men who's grandfathers were on that attack line 100 years ago. We did this in the exact location, on the exact route, at the exact time the 16 battalion did 100 years prior to the minute and we even paused at each line to wait for the artillery barrage. We brought the Red Rum and toasted their grandfathers and the other men that gave their lives that day with sterling shot glasses that were owned by one of the guys grandfathers that lost his life there. It was an incredible experience. That afternoon was the big ceremony at Vimy to mark the 100th anniversary. It was very impressive but nothing compared to the personal experience I had. My airbnb host Micheline gave me a parting gift of an brass casing to that artillery shell I found. It had been designed with a poppy by the troops in the trenches during WW1. Thank you to Veterans Affairs for thinking of our Aboriginal veterans and all the first nations soldiers that served and made the ultimate sacrifice. The whole trip was incredible and something I will never forget as long as I live as I will never forget those brave men that gave their lives. the National ceremony to remember the Battle of Vimy Ridge. April 9, 2017, marked the 100th anniversary of the Battle of Vimy Ridge. One of the most consequential battles of the First Word War and one in which Canadian troops played a pivotal role. The Battle of Vimy Ridge was commemorated in Vimy, France, in Ottawa and all over Canada. For over two years, the Métis Nation of Ontario (MNO) Veterans’ Council worked hard on their Vimy Commemoration Project. They planned and fund raised to bring Métis veterans together with Métis youth for Vimy commemoration events in Ottawa the weekend of April 9. Starting the evening of Friday, April 7, ten MNO veterans were joined in the national capital by seven Métis youth from Ontario as well as six Métis Nation British Columbia (MNBC) veterans and one Métis youth from British Columbia. The following Saturday, the group toured the Canadian War Museum and the Canadian Museum of History during the day and attended a special banquet in the evening. At the banquet, the veterans and youth heard from MNO President Margaret Froh who presented a number of Louis Riel medals to MNO veterans while MNO Veterans’ Council President Joseph Paquette presented Louis Riel certificates to the same individuals. During the evening, the MNO Veterans’ Council also presented certificates of appreciation to the MNO and MNO President Froh for their support of the Vimy Commemoration Project. The MNO Veterans’ Council also presented President Froh with the original artwork used to create a Métis memorial erected in Penetanguishene (Click here for story). MNO Ottawa Region Métis Council President Benny Michaud and Senator Parmilia Bergie were also presented with certificates of appreciation for their Council’s support of the Vimy Commemoration Project. Another highlight of the evening was a presentation from police veteran and MNO Great Lakes Métis Council Senator Ralph Wolf Thistle, who on spoke about his experience with Post-Traumatic Stress Disorder (PTSD). (Click here to learn more about Senator Thistle’s experience with PTSD). On Sunday morning the veterans and youth attended the national ceremony to remember the Battle of Vimy Ridge at the National War Memorial. 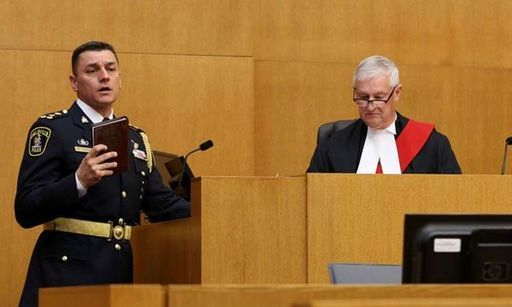 Two MNO citizens had direct roles in the ceremony. During the ceremony “The Act of Remembrance,” is traditionally read by veterans in in English, French and Michif. MNO Veterans’ Council Chair Guy Mandeville read the Act in Michif. The “Commitment to Remember” that follows was also read in English, French and Michif and PCMNO Post-Secondary Representative Katelyn LaCroix read the Commitment in Michif. The MNO Veterans’ Council plans on providing an extensive article about all the events that were part of their Vimy Commemoration Project, which will be posted on the MNO and MNO Veterans’ Council websites and published in an upcoming edition of the Métis Voyageur newspaper. 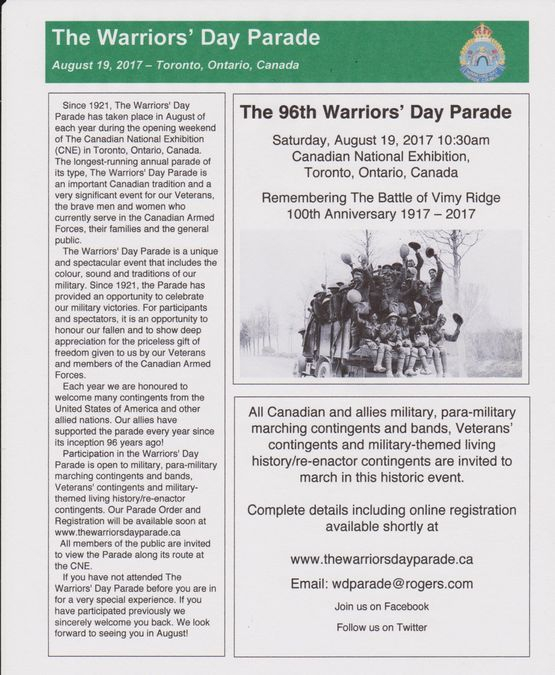 For those who may not have the opportunity to attend and participate in the MNO AGA this August in Kenora, please consider the following opportunity and support MNO Veterans by participating and wearing your Metis sash in the Warriors Day Parade in Toronto. Please note that the position was officially filled In April 2017.
is eligible to be nominated as a candidate pursuant to the Electoral Code of the MNO, Part A, as amended from time to time. the appointment is made by a majority vote of the Veterans council. Therefore council is serving notice of vacancies that currently need to be filled on council. Interested candidates need to send either a Resume or Letter of Intent with recent address and MNO Citizenship number to the attention of the Metis Nation of Ontario Veterans Council. All candidates will be vetted through the Registry for verification and those verified will be sent to council for their consideration. February 28, 2017. Council will inform the successful candidates after their next council meeting preceding the deadline for nominations.